As individuals and as an organisation, Moncrieff believes in assisting those in need. Recently, Moncrieff donated computer equipment to Leavers2Leaders program of the Swan Christian Education Association. On 19 November, the Leaver2Leaders travelled to the Philippines with the computer equipment in hand. The donation was given to Filipino students in the communities of Sagay, Cabacungan and the ATI school in Boracay. Additional, the technology was shared with the local community such as a crab-meat business employing more than fifty women in Purok Bangkal. 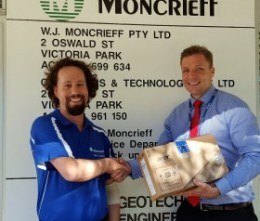 To read more about the donation and program: ‘Moncrieff’ ICT Company gives generously to SCEA Global recipients in the Philippines! and MONCRIEFF ICT COME THROUGH WITH MORE DONATIONS ! !